Like many teachers, I'm very familiar with Stem. But just imagine my surprise when I accepted a job offer and spotted that the additional responsibility of Steam coordinator. Was it just a typo? Apparently not. We all know that Stem is a well-known curriculum using four disciplines, science, technology, engineering and maths, to solve problems based on real-world scenarios. Ultimately, the inclusion of 'A' for 'arts' turns Stem to Steam, with the goal of enabling true innovation and a new way of thinking creatively. Photographic manipulation is a great way of getting to know a group of students. Start by taking a look at a few different artists; as I’m in Italy, we are taking a closer look at the works of Michelangelo, Leonardo da Vinci and Raphael. Ask pupils to choose a painting which inspires them and take a selfie that mirrors the pose in the picture. They can then experiment with manipulation software using tools such as the 'magic wand' and 'lasso' to create their very own masterpiece. This arty experiment shows how plants use 'capillary action&' to take water up their stems to the petals. Keep a diary so that you can compare the results you get with different colours over a few days. How about trying to make a rainbow of flowers? You can mix different food colouring together to create different shades. Instead of using daffodils, why not try using carrot tops or cress seeds? It&';s easy peasy! Bring the outdoors into your classroom with this inspiring activity from the Woodland Trust's nature detectives website. This unit of work had been designed to compliment the SUNFLOWERS SCIENCE/LITERACY - UNIT OF WORK. These units of work include everything you will ever need to complete a topic on Sunflowers. This part of the unit covers the Numeracy/Art aspects of the topic with close links to Science. Numeracy has a Powerpoint presentation that starts the investigation into Fibonacci patterns. There is also activities that cover; measuring and shape sorting activities, estimating and fun money/costing activities. An enrichment Art activity explores the 15 Sunflowers by Van Gogh and the pupils are then challenged to solve some thought provoking time/date related word problems.This work can be completed in class or set as an extended homework activity. One of the most famous tried-and-tested Stem projects is to design and build a catapult or a projectile launcher. Students have to simultaneously use knowledge of angles and distance, basic trigonometry, geometry, ratios, engineering, critical thinking and teamwork to formulate and implement their designs. To add an element of art, my classes examine the work of Da Vinci, in particular his inventions, and explore how these are conveyed through detailed working drawings. It's historical Steam in action! 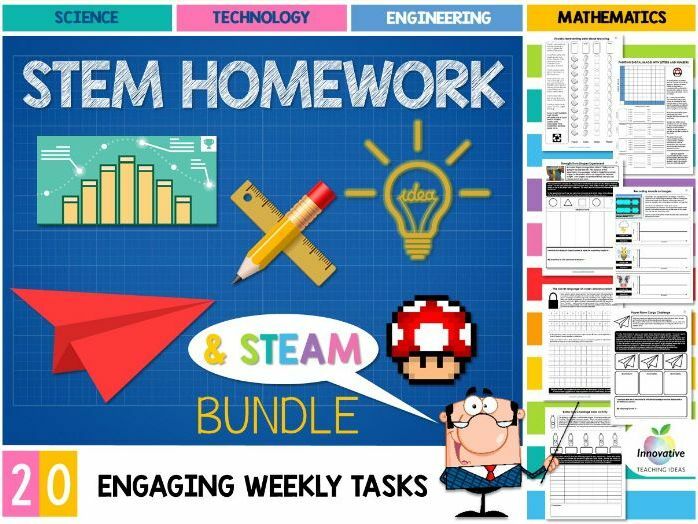 Twenty weeks of engaging ⭐STEM / STEAM⭐ independent tasks are included in this engaging bundle designed for students aged 8 - 12 years old. This is excellent for covering both DIGITAL TECHNOLOGIES and DESIGN AND TECHNOLOGIES. All with ABSOLUTELY NO PREP REQUIRED!! Just print out and away you go... All instructions are easy to follow and will involve students completing all tasks at home. Answer sheets included. ✔ Recording sounds as images. ✔ Which shapes are the strongest? Best of all if you buy in NOW you will receive ALL FUTURE ADDITIONS FOR FREE we regularly add more tasks. These additions will incur a greater expense for late adopters as THE PRICE WILL RISE. 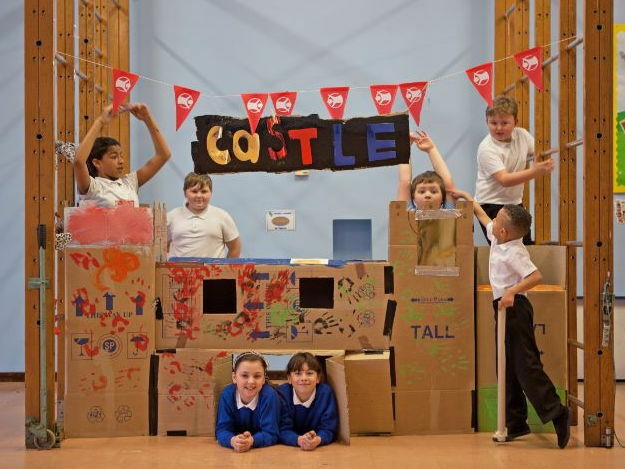 To support pupils taking part in Save the Children's Den Day, use these resources to challenge children to build a structure that stands, out of everyday materials. The accompanying presentations for KS1 and KS2 can be used to help children learn about the impact of natural disasters and how families can lose their homes. These resources have been specifically designed to use for Save the Children's Den Day on Friday 16 June. Schools around the UK will be building dens out of everyday materials and raising money to help give more children around the world a safe place to shelter. Sign up at denday.org for your free fundraising kit with everything you need to take part. Steam, as with Stem, is all about grounding critical thinking and problem-solving within real world examples. Continuing with theme of great artists, classes can explore perspective and composition and use their findings and 3D software to produce architectural models of their dream homes. Alternatively, investigate Da Vinci’s anatomical studies to give learners a greater understanding of ergonomics and anthropometrics, as well as how products are designed to suit peoples’ specific needs. 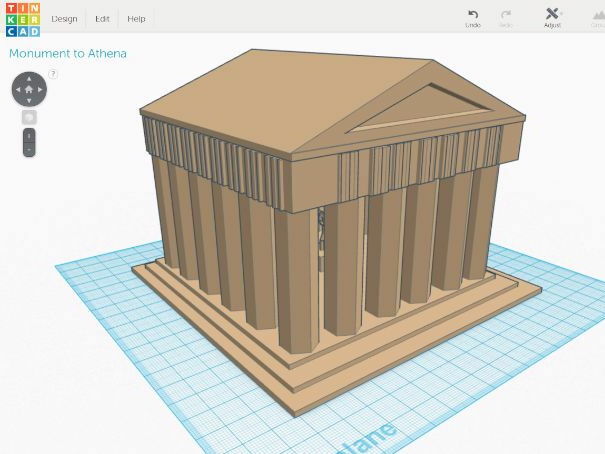 In the Designing Greek Monuments in 3D lesson, students design new monuments to honor events in Greek history, Greek gods, or another aspect of Ancient Greece. After sketching their design on paper, students create their designs in 3D using the web-based modeling tool TinkerCad. Finally, students explain their creations in a short essay to accompany their designs. Primary CT concept: abstraction. Students distill information about a Greek god or an event in Greek history into a relatively simple 3D design that symbolizes their chosen topic. This activity can be run in one longer period, or split over two shorter periods. A downloadable booklet of fun science activities using everyday ingredients, with notes for teachers. This booklet contains step-by-step instructions for science activities and experiments that are safe and easy to do in the classroom or at home. Art adds a new dimension to the creativity and flair that Stem seeks to promote, therefore adding the 'A' can only be a positive step. This is a chance to really think outside the box with much greater scope for experimentation. Steam activities encourage the use of different, unconventional materials and the opportunity for students to learn many new and exciting skills. For me, the aim is to include performing arts and drama with scope for set design, puppeteering and animation for a complete cross-curricular extravaganza!